Albert Frederick Huff was born on January 10, 1917 in Walla Walla, Washington. He was the second child of Andrew Elick and Marguerite Delphine (Nibler) Huff. During his early years, his father worked as a house painter and the family moved several times. By 1920 his parents homesteaded 160 acres east of Heppner, Oregon in the Blue Mountains. In 1939, the family moved to Portland (Rose City) where they stayed with his father's sister Nettie. The family moved from there to Tobias, Oregon and finally to Hillsboro where Elick and Delphine bought an 11 acre strip of land south of Shute Park on 8th Avenue. Albert was drafted into the US Army on January 11, 1944. It was during his military service that he added his Catholic confirmation name, "Joseph," to his identification. He served in the Battle of the Bulge and met General Patton. After his miltary service, he married Bertha. The couple divorced. On May 12, 1956, Albert wed Olive Emerald Sly. The couple built their own home together on an acre of the family land on 8th Avenue. Albert worked for the City of Hillsboro Water Department. 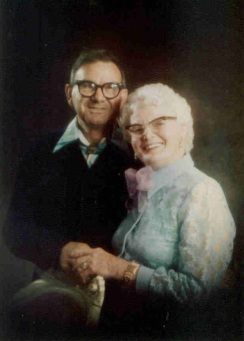 After retiring, Albert and Olive sold their home and moved to their property in Boardman, Oregon. In 1990, Albert became ill with cancer. On December 7, 1990, the anniversary of Pearl Harbor, Albert lost his battle. He was buried in Skyline Memorial Gardens in Portland, Oregon.